The Ricoh CX6 is an updated version of its still available predecessor, the Ricoh CX5. It adds aperture/shutter priority, continuous AF shooting modes, plus faster start-up and shorter shot-to-shot times. Aimed at those looking for a high quality compact camera to act as a second camera, the Ricoh CX6 has aperture and shutter-speed priority modes for more control. It also has a noise reduction function, designed to produce high-quality images. It stands against quite a few market competitors, such as the Nikon Coolpix S8200, Samsung WB750 and the Sony Cyber-shot DSC-HX7V, to name just a few. 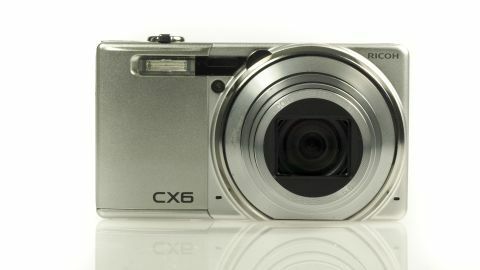 They all have physically similar sized CMOS sensors and are cheaper than the Ricoh CX6, which is priced at £259.99 (around $420) in the UK. The Ricoh CX6 is a 10MP camera with a 10.7x optical zoom, equivalent to 28-300 mm on a 35mm film camera. There is also a digital zoom facility that extends up to 2880mm. As well as having a far-reaching zoom, the camera benefits from a close macro distance of 1cm. You also have the option of choosing between eight fixed lengths using the step zoom. Images are captured on the back illuminated CMOS sensor, processed by the Smooth Imaging Engine IV and can be reviewed on the 3-inch 1.23 million dot high-resolution LCD screen. This Ricoh camera has a 5fps high-speed continuous shooting mode, with a theoretical capacity of 999 pictures. You can easily switch to shooting HD movies or Snap Movies - films that can be 60 seconds long. Ricoh claims the CX6 achieves fast AF focus times of 0.1 sec, and it also benefits from a wide range of focus options: Multi AF, Spot AF, Face-priority Multi AF, Subject-tracking AF, Multi-target AF, Manual Focus and Snap. There are also three metering modes to choose from; multi, centre-weighted and spot. For precise composition, three grid guide displays are provided: 3 x 3 grid, centred subject grid and a clear view grid. Perhaps one of the camera's most attractive features is the wide array of shooting modes and creative filters. It includes all the regular scene modes, such as Landscape, Pets, Portrait and Night Portrait, as well as more dynamic modes such as Skew Correct, Golf Swing Continuous and Cooking, for subject-specific shooting, as well as more advanced shutter and aperture priority modes. The camera's creative filters include Dynamic Range Double Shot, Miniaturise, Bleach Bypass, High Contrast B&W, Soft Focus, Cross Process and Toy Camera.